In The Dark Knight Rises, Christopher Nolan's grand conclusion to his Batman trilogy, an unassuming scene captures the essence of what resonates with me in this outlook on the hero: a beat cop turned detective, John Blake (Joseph Gordon-Levitt), walks the streets of a ravaged, desolate Gotham, using a piece of chalk to draw modified Bat-symbols. It's an emblem of hope and fortitude, during a time when there's no assurance that the city's demonized guardian would pull them from the vice of anarchy threatening to wipe Gotham off the face of the map. Orchestrated with bombast to spare, the situation leaves one wondering whether they'll even be able to survive this hopelessness, marked by lethal twists-'n-turns and a decimated social infrastructure. To say that the execution of Rises' revolutionary setting comes as a surprise -- both in rewarding conventionalism and how it pushes realism to the edge of plausibility for its complex theatrics -- would be an understatement, and the way the hero emerges to answer the call of those chalked symbols does nothing short of exhilarate. From the beginning, Nolan and his writers -- David S. Goyer for Begins, Jonathan Nolan for The Dark Knight and Rises -- have incorporated elements of the graphic novels into their trilogy, only tweaked to fit into the universe's tone and realism. Taking pages from "The Dark Knight Returns" at first, where they set up a point for an older, retired, grieving Batman to reemerge, the story advances forward eight years to a time when organized crime has been largely contained through an initiative called the Dent Act. 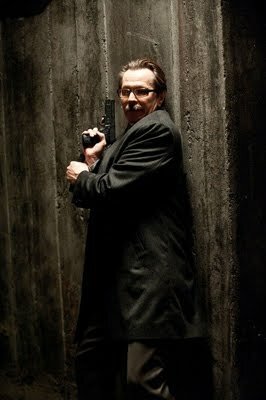 Following the events of The Dark Knight, where Batman is forced to hide in the shadows due to suspicion of murder, Bruce Wayne (Christian Bale) lets himself wither in the halls of his echoic lofts of his mansion, lamenting the losses of loved ones and brooding over his moral choice for the greater good of Gotham. 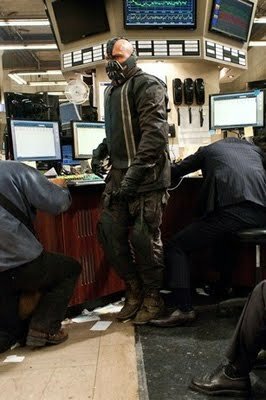 This peace doesn't last, though: a new threat, the muscular and masked idealist named Bane (Tom Hardy), gradually plants seeds of destruction around the city that drives Batman out of the shadows, once he delivers a personal blow to Bruce. He's there to make sure that Gotham is reduced to ashes, but not without suffering. The Dark Knight generated substantial critical success, but one impression frequently emerges about the anarchy that The Joker brought onto Gotham: it wasn't as focused on being a comic-book movie like Batman Begins, despite an imposing and impressive presence. While I hesitate to say that this changes significantly with Rises, Nolan and his creative crew have certainly brought the material closer to that stature. Gathering thematic elements spread across the trilogy, from Batman as an elemental representation and Bruce Wayne "picking himself up" from adversity to the symbolic destruction of Gotham City, Nolan gives his ideas an unrestrained, persistent presence while exploring the billionaire's damaged psychosis. In fact, it wouldn't be unreasonable to say that Rises focuses far less on Batman as an entity himself; Wayne's melancholy seclusion, his defeatist attitude when talking to his dutiful father-figure butler, Alfred (Michael Caine), and his Wayne Enterprises "tech consultant" Lucius Fox (Morgan Freeman), and his reluctant reemergence in society -- and into a new relationship with sustainable-energy proponent Miranda Tate (Marion Cotillard) -- run parallel to the tainted essence of the city he dedicated his life to defending under a thankless mask. A mythical quality stirs here, underscored by iconic visual reflections from the books repurposed for Nolan's context. The city of Gotham remains a collective character of its own in The Dark Knight Rises, heightened by newly-introduced faces that operate as the paragons and deviants that populate the metropolitan area, products of its corruption similar to that of Bruce Wayne. Aside from Lieutenant James Gordon, whom Gary Oldman once again handles admirably, Joseph Gordon-Levitt becomes the portrait of integrity and virtue as "hot-headed" cop John Blake, whose ties with an orphanage provides an added emotional facet to the conflict that'll arise later on. Perhaps the most interesting, though, is Selina Kyle, an expert thief who first associates with Bruce Wayne as a mark for her talent. Anne Hathaway expertly distills sauciness, desperation, and malleability in this take on the ... uh, "feline" renegade who wishes for nothing but a better life and a clean slate, offering a compelling counterpoint to both Batman and Bruce Wayne as an entity who slips in and out of the same shadows that the hero hides within. The urge might arise to dismiss these characters as superfluous entities in terms of how they apply to the main plot, something of a recurring issue with Nolan's work, yet their solidly-written presence as byproducts of Gotham City's uglier side are more vital than their superficial purposes. Bane's presence, however, triggers thoughts of another significant storyline in Batman's universe, which becomes the ultimate driving force behind The Dark Knight Rises: a true match, a lynchpin, to the hero's prowess and determination during a time when he's needed most. Heath Ledger's Joker raised the bar rather high for any future villains that'd emerge in Nolan's overarching narrative, but Bane comes much closer to matching that menacing presence than expected; he's more structured, methodical, and driven by a concrete ideal, but it's that clutch he has on his motivation -- and Hardy's overall intimidating stature -- that embolden his tenacity. Through Hardy's thick, rather indistinguishable accent and a tack-sharp intellect that actually befits the character (unlike the abomination of a henchman in Batman & Robin), Bane orchestrates a plan through an agenda that astutely revisits the antagonistic themes present in Batman Begins, about the decadence and corruption of Gotham being irreparable without somebody hitting the restart button for the city's citizens. The moral grayness here is engrossing. 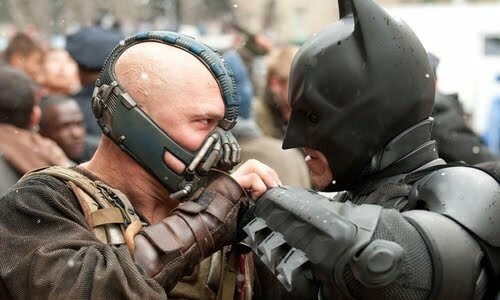 Chris and Jonathan Nolan tackle a metric ton of content as Bane's plan to dismantle Gotham takes shape, enough to make well over two and a half hours of hefty, dialogue-heavy content effortlessly weave together with the lofty social musings and byzantine plot devices that hallmark the franchise. Yet, the Nolans's writing also asks the audience to tolerate some lapses in logic and practicality -- as well as engaging in critical interpretation and to not take certain scenes quite so literally -- when grasping the scope of their design this time around, something they're talented enough to avoid; they've always exhibited painstaking eyes for detail, yet a few overzealous flourishes of exposition and bombast produce some instability in their architecture. Could Batman's identity be discovered like that? Would the police force really make that decision? How did Bruce Wayne get from there to there? And so on and so forth. The ideas they spark justify whatever issues arise in the writing's clarity, though, framing Gotham's frightening collapse in raw contemplation about terrorism, the economy, militaristic control and even usage of alternate forms of energy. This isn't their tightest writing job, even negligent in certain areas, but it's arguably their most ambitious and viscerally involving. The Dark Knight Rises leads to a point where Gotham City once again comes under attack, only the stakes are far higher by way of Bane's plotting -- and it's made quite apparent through the film's bracing visual and artistic tempo. In Batman Begins, the city fell under attack with a limited number of people being aware of Ra's al Ghul's threat; in The Dark Knight, the Joker's terrorist activities were broadcast on television and involved a substantial number of people affected by his demands; in Rises, however, every single citizen of Gotham knows they're under siege, and feel the immediate pressure. Nolan clearly wants to create an aesthetic hybrid of the previous two films while depicting this chaos, which shines through Wally Pfister's strikingly meticulous shots of a desolate, ice-laden Gotham and Hans Zimmer's score powering it in the backdrop, conveying palpable mayhem and destitution. This time, the crew incorporates a substantial uptick in IMAX footage, adding range and depth to hand-to-hand brawls, car chases, and authoritative acts of violence that bleed together much more seamlessly than the footage in The Dark Knight, partially because of the frequency but also because of the scenes' "necessary" breadth. 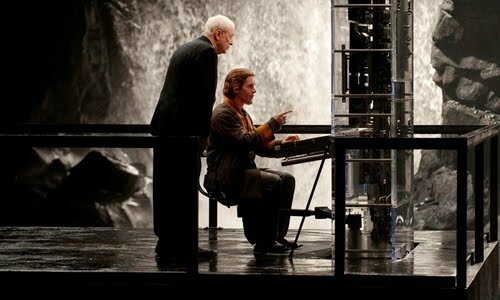 Thinking back to the choppy, blitzed hand-to-hand sequences in Batman Begins and marveling at how seamlessly put-together everything appears here, it's astonishing to see exactly how far Nolan and his crew have progressed in the technical department -- mostly, of course, in the action set-pieces. The camera's allowed to linger in The Dark Knight Rises, whether Selina Kyle braces a Wayne Enterprises suit against a wall or Bane and Batman brawl in arguably one of the film's crowning sensory achievements, and that steady-handed focus persists throughout explosive motorcycle and air-vehicle chases that could've spun and sputtered out of control. From start to finish, however, Nolan orchestrates bleak, exhilarating, and polished grand-scale filmmaking of the highest accord, showcasing the proper points to go overboard and when to restrain the perspective to a simpler, sleeker level. This is no chance occurrence; it's the product of seven years of refinement and operating on a learning curve, where the director of an indie project like Memento molded his subversive filmmaking angle onto a massive, imaginative scale. 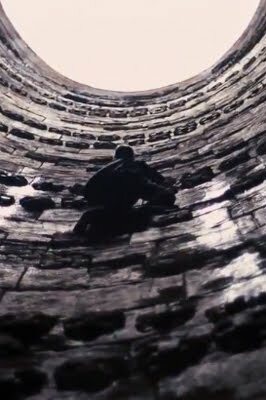 Perhaps the most unexpected thing about The Dark Knight Rises is Christopher Nolan's openness to bucking his nihilistic conventions for a crowd-pleasing, comprehensive resolution to the hero's journey, balancing one of his signature interpretive endings with odes to moments across the series (and the comics). He weaves a plot twist involving Bane's motivations -- and a stony, windswept cylindrical prison out on the middle of India nowhere -- with a brisk rush to save Gotham, bringing the story full-circle to the original idea of Batman being a faceless, enduring presence that'll persevere as long as Gotham needs the entity. And while Nolan doesn't make the penultimate conclusion one with a completely straightforward answer, leaving certain elements up to the audience's imagination in terms of Batman's fate, he focuses the ending's viewpoint in a way that, at the very least, conveys an optimistic look at Gotham's future. The bittersweet nature of it all achieves a deeply-felt and rewarding sensation following the rigorous bedlam that Christopher Nolan drags his audience through, lending even more credence to the weight of those hopeful chalk bat-symbols scrawled across the city. It's an impressive finale.